If you’ve done an upgrade or had to reinstall Snow Leopard (10.6), then when you try to run a PowerPC application a dialog box appears, that says the application can’t run natively and you need to install Rosetta. If your Mac is connected to the Internet, clicking a button in the dialog box downloads and installs Rosetta. 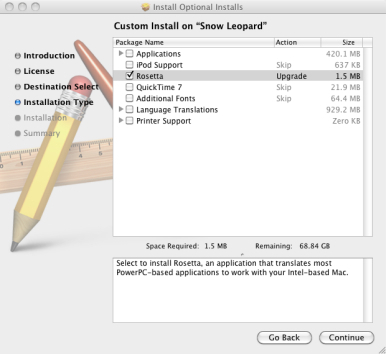 If that fails to work, insert your Snow Leopard disc, open the Optional Installs folder on that disc, and double-click the Optional Installs.mpkg package. The Installer will open and you’ll be prompted to click Continue a couple of times and then choose a destination for the installation. Choose your startup volume and click Continue again. In the Custom Install window that appears, enable the Rosetta option and click Continue. Then in the next window click Install.